A successful season starts with clean floors. Set the stage for a profitable harvest by controlling weeds in your operation with top-performing herbicides. 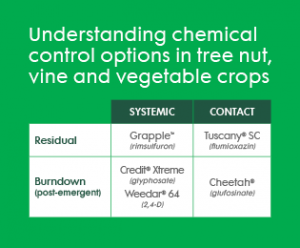 Nufarm offers a powerful weed control program for tree nut, vine and vegetable operations. When you want weed control done right consider their burndown and residual herbicide options. Whether you need a contact or systemic herbicide, Nufarm has you covered to control the weeds and help your crops reach their best potential. See the guide below for specific product information. Grapple™ herbicide delivers outstanding weed control on many crops, with excellent performance against the unique challenges of vineyards and orchards. Count on Grapple to knock down existing weeds and keep floors clean with lasting residual. Plus, Grapple is tank mix compatible with many pre-emerge herbicides for added weed control options. Tuscany® SC herbicide blocks tough weeds with long-lasting residual control of more than 60 weeds. Liquid Tuscany SC stays where you put it, with low leaching or volatilization potential. Plus, it offers excellent rotational flexibility and enhances burndown of existing weeds when tank-mixed with Cheetah® or Credit® Xtreme. Credit Xtreme is an exclusive, patented formulation containing dual salt glyphosate technology. Credit Xtreme offers a unique high-load formulation, efficacious performance and exceptional compatibility with phenoxy herbicides, even in hard water. Cheetah utilizes a novel mode of action to better protect your high-value TNVV crops from weed competition including triazine-, ALS- and glyphosate-resistant weeds. This fast, effective, non-selective herbicide will let you focus more on profitability and less on weeds. Weedar® 64 is a low-volatile, premium DMA-4 formulation that is sequestered to 1,500-ppm water hardness. This “workhorse” of 2,4-D amines is registered for a variety of settings including tree fruit and nut crops. Weedar is an excellent choice for dormant sprays. For more information on the complete lineup of herbicide solutions go to Nufarm.com/uscrop or contact your Nufarm rep.